(Greenville Borough, PA – Date) Greenville Borough announced today it is among a select group of high performing municipalities to become certified through the Sustainable Pennsylvania Community Certification program. Greenville Borough is recognized at the Gold level of certification for meeting the program's rigorous performance criteria which tracks 131 policies and practices that define a sustainable community. The Sustainable Pennsylvania Community Certification, administered by the Pennsylvania Municipal League in partnership with Sustainable Pittsburgh, is designed for municipalities that are working to save money, conserve resources, and serve vibrant communities. Originally deployed in Southwestern Pennsylvania by Sustainable Pittsburgh, the certification has gone state-wide recognizing small, medium, and large municipalities across the Commonwealth. The Pennsylvania Municipal League and Sustainable Pittsburgh applaud municipalities for their demonstrated commitment and sustainability performance. In earning the Gold certification, Greenville Borough is acknowledged for its progress in addressing such areas as community design and land use, energy efficiency, health and wellness, intergovernmental cooperation, recycling and waste reduction, fiscal controls, and internal management and operations. Details regarding how Greenville Borough is addressing these areas can be found on the certification program’s website: www.sustainablepacommunitycertification.org. 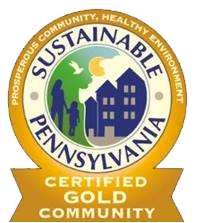 "Greenville Borough is proud to be recognized as a Gold Certified Community by the Sustainable Pennsylvania Community Certification program," said Jasson Urey. "Greenville Borough has a long history of commitment to saving taxpayer dollars, using resources efficiently, and applying best practices in municipal government and community development. We are pleased to be recognized and be part of the regional community of good government." "We are delighted to see Greenville Borough distinguished among local governments that are leading the way in applying sustainability to both their operations and management as well as within the community," said Anne McCollum, Director of Training and Development, Pennsylvania Municipal League. The Certified Community by the Sustainable Pennsylvania Community Certification is intended to bring recognition to municipalities that are applying the policy and practice of sustainability as their way of operating to advance community prosperity. It also serves as a mechanism for sharing best practices for creating a more sustainable Pennsylvania. "Municipalities that earn the Sustainable Pennsylvania Community Certification are standouts in demonstrating adherence to best practices that elevate them as communities of choice to live, work, and play. Commitment to continuous improvement is at the heart of sustainability and the certification program is a means to accelerate municipal performance," said Court Gould, Executive Director, Sustainable Pittsburgh. Details about Greenville Borough’s certification performance can be found by linking to www.sustainablepacommunitycertification.org. The Pennsylvania Municipal League (PML) is a nonprofit, nonpartisan organization established in 1900 as an advocate for Pennsylvania’s 3rd class cities. The PML represents participating Pennsylvania cities, townships, town, boroughs, and home rule municipalities that all share the League’s municipal policy interests. PML provides a wide array of municipal services including legislative advocacy (on both the state and federal levels), publications designed to educate and inform, education and training certification programs, membership research and inquiries, consulting-based programs, group insurance trusts, and the statewide Sustainable Pennsylvania Community Certification. Specific to Southwestern Pennsylvania, PML is partnered with Sustainable Pittsburgh for outreach. Sustainable Pittsburgh affects decision-making in the Pittsburgh Region to integrate economic prosperity, social equity, and environmental quality as the enduring accountability bringing sustainable solutions for communities and businesses. Over the past 19 years, Sustainable Pittsburgh has proven adept at building coalitions for the policy and practice of sustainable development for southwestern Pennsylvania. SP educates and engages decision-makers and in turn elevates expectations for integration of the 3Es (environmental conservation, social equity, and economic prosperity) among government, businesses, nonprofits and academia.